We specialise in converting your existing chlorine system to a salt water purification system for a lot less outlay than you might imagine. Salt pool systems are popular because they’re very low maintenance . They require very little in the way of expensive chemicals or day-to-day upkeep. And the convenience of always being swim ready and always having soft water sure beats the harsh red eye and dry skin experiences that can result with chlorinated pool system. After a swim in a new salt water pool, most people would easily be convinced that a salt pool system is the way to go. Call Gary on 027-577-8464 to arrange a consultation. Consistently maintained sanitizer levels in the pool water will prevent the growth of all common algae. A salt-water chlorinated pool requires much less attention than a chlorine pool. A salt water pool provides a more comfortable swimming environment. Salt water feels better and is less irritating to the body than standard chlorinated water. Hydrochlor TS features an easy to use analogue timer. Just move the tappets to either the on or off position to program the chlorinator. Hydrochlor TS include a battery that allows timer to “remember” the latest setup in case of power failure (or a slave type operation), or in systems where repeated power cuts occur. Hydrochlor TS Self Cleaning Salt Cell has the added ability to reverse voltage polarity to clean calcium build-up off its electrodes. Hydrochlor TS has include a salt cell protection mechanism. The chlorine production will stop whenever it’s detected a no flow condition. 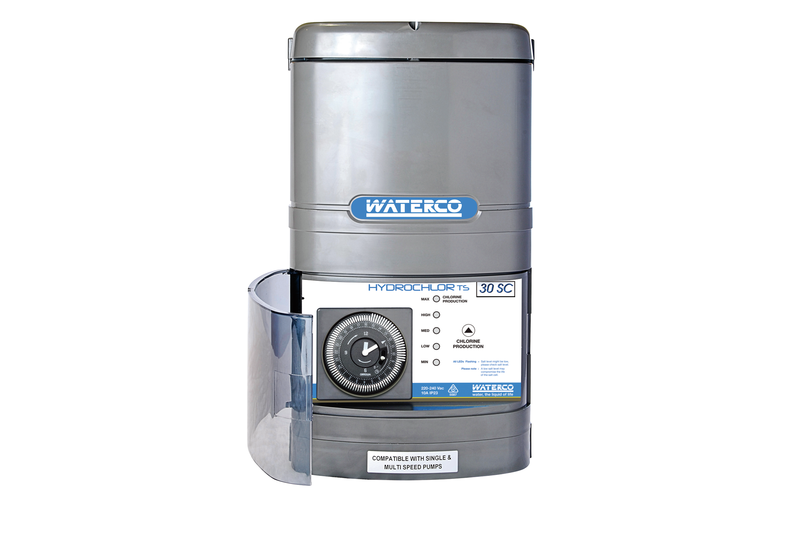 The Hydrochlor will automatically maintain the chlorine level of your pool and eliminate problems associated with periods of very high or low chlorine levels. Fewer fluctuations in chlorine levels mean fewer fluctuations in pH levels. This adds up to more stable, balanced water.